COMSTOCK, Mich. – Bell’s Brewery is honored to celebrate another independent craft brewery’s 30th Anniversary. Tim Gossack, Bell’s Production Manager, was one of eight former Deschutes brewers invited back to Bend, Oregon to brew a special, unique one-time collaboration brew to help celebrate Deschutes Brewery’s incredible milestone. 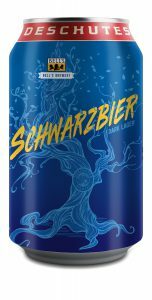 Schwarzbier is a Dark Lager with an ABV of 6.4%. This limited release will be available on draught and in 12 oz. cans packaged in 6-packs. Gossack was Head Brewer at Deschutes from 1990 until 1996. The recipe is a modified version of a recipe Gossack created after leaving Deschutes. “Deschutes Brewery launched my career in brewing and I have been forever grateful to have worked there. I was hired for my science background and cursory knowledge of beer brewing and beer styles, Gossack said. The beer will begin shipping to Deschute’s distributors in late August in states that Bell’s does and does not currently distribute to. The can will include the Bell’s logo and the story of this collaboration beer. The Deschutes Brewery 30th anniversary collaboration “family tree” also includes John Harris, Deschutes Brewery’s original brewmaster with Ecliptic Brewery, Frank Appleton a brewing consultant responsible for creating the recipes of Deschutes’ beloved brands such as Black Butte Porter and Cascade Golden Ale, Tony Lawrence from Boneyard Brewery, long time brewer Mark Vickery, Paul Arney from The Ale Apothecary and Cam O’Connor and Larry Sidor, now with Crux Fermentation Project. Bell’s Brewery, Inc. began in 1985 with a quest for better beer and a 15 gallon soup kettle. Since then, we’ve grown into a regional craft brewery that employs more than 550 people over a 40 state area, in addition to Puerto Rico and Washington DC. The dedication to brewing flavorful, unfiltered, quality craft beers that started in 1985 is still with us today. We currently brew over 20 beers for distribution as well as many other small batch beers that are served at our pub in Kalamazoo, the Eccentric Cafe. Our ongoing goal is to brew thoughtfully, creatively and artistically. 100% family-owned and independent, we strive to bring an authentic and pleasant experience to all of our customers through our unique ales and lagers. For more information, please visit bellsbeer.com. You can also follow Bell’s on Facebook, Twitter, Instagram, Snapchat and Untappd.